An easy-to-read scientific article about color through the eye of the insects pollinating our favorite flower. It forces you to consider an orchid’s appeal through a different lens. Become one with a wasp, moth or fly and understand how color triggers them to eat, mate and lay eggs. Twilight Zone material! Insects often see light spectrums that are invisible to the human eye, such as UV and Infrared light. Enhanced by their compound (faceted) eye structures, they interpret light differently from us, and it begs the question? how does orchid color make an insect tick? This article abounds with examples of how color influences insect behaviors. 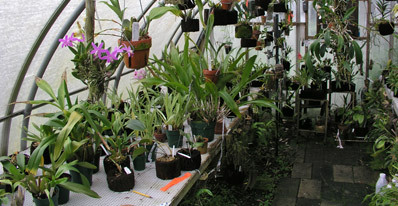 Such as: white or cream colored orchids reflect light at dusk and in the evening thus attracting moths. It also discusses how the one third of nectar-lacking orchids deceive insects into the daily rituals that pollinize them. In brief, studies have found that orchids lacking nectar may be the keystone to “greater evolutionary fitness”. The insect is drawn in to eat; once realizing its follies and disappointed, it leaves immediately, flying further away. It is then attracted to other orchids, thereby increasing the natural genetic diversity of the area. Read this article (order or check out the library copy) to better understand the electromagnetic spectrum, how insects interpret color and to learn what Batesian, generalized and guild mimicry means. Super fascinating and makes for great dinner conversation!